Recommendation: You believe in super powers, abilities and the good that one can do with it, then this is the series you should read. 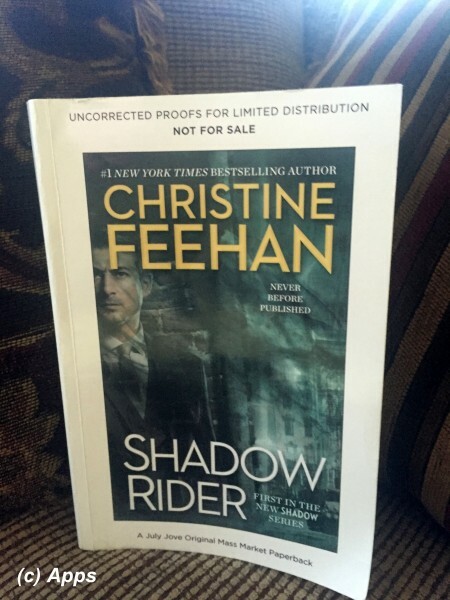 The Shadow Rider is the first book in the new series The Shadow Series by Christine Feehan and published in June of 2016. The plot is set in Chicago, a location used second time in a series but different from her usual Carpathian Novels (Post link to my review here). The Team III (Marine Force Recon Urban Warfare Team)in her Ghostwalker Novels (Post link to my review here) are also based in Chicago. The first book - The Shadow Rider - follows the story of Stefano Ferraro - oldest Ferraro - and Francesca Cappello - who comes to Chicago to start a new life. The Shadow Series is about the powerful Ferraro family who are revered with both admiration and fear. For they are famed to have powers and abilities that not a normal human can have. Albeit that is only a rumor but they are more feared because of the ties to mob that they are known to have. Neither of these allegations ever could be proved. Power clung to them. But the neighborhood that the Ferraro family had hold on - Little Italy - has been crime-free, secure as well as a happy place for any of them to live. People are taken care of as their own until the line crosses where the punishment is severe and sometimes unforgivable. Everyone in the Ferraro family and the extended families are very successful, powerful, handsome/beautiful and with a hoard of abilities in them. Yet, they are not complete until they find their mate, the one that can match them in power, character and needs - for the Ferraros have high sexual appetite especially after they have used their abilities - to manipulate light and shadow to their advantage. Stefano Ferraro, commanding the Ferraro family business - legal most times and illegal at times but unproven - and always gets what he wants, be it cars, women or getting the family business more successful. Nothing came above the Ferraro family business for him, and his work was very hard and very dangerous. Francesca Cappello comes to Chicago looking for a new life - with little to nothing on herself. Her friend Joanna Masci offered to help her out by getting her a job at her Uncle Pietro Masci's local deli. Stefano sees her and immediately realizes she is the one for him, in every sense of the way. He openly stakes his claim on her in the deli, making sure Pietro gives her the job at the same time. Yet Francesca couldn’t understand why he had picked her, especially when she thought he was some sort of mobster. And to top it he gives her his coat and cash, on loan, despite her refusal. Now, she is worried that she will be in limelight again - the very thing she had escaped from in the first place. Stefano has found his mate and he is relieved that there is hope for others. Where one walks, the others follow - that has been the legend always. But, how will he convince Francesca that she is as much his as he is hers, and that there is no other. Add to that his family business, the secrets they have that they don’t share to anyone outsider, the lines that he crosses or his family - will Francesca accept all that? However, what Stefano is unaware of is the dark secret that she is hiding, a secret that could get killed everyone around her including her. Will she trust him enough to confide in him, take his aid and overcome the monster that has been haunting her? What is the big secret that Stefano has? Will he be able to bind her to himself as is the tradition? The Ferraros also seem to have a century old enmity with the Saldis - another Italian family from their home town Sicily. How will that impact for Stefano and Francesca? And then someone is out to hurt Francesca in this new place. She hardly was settled and she was worried that her past had already caught up with her. Will she take a risk and ask for Ferraros assistance? Will they believe her? Will she have to go on the run again? A very different and unique concept Christine has picked up - I wonder how did she come up with. It is still filled with the super-human abilities, but totally different from what we have seen in her books so far. I am glad that Christine didn’t make her heroine look lean and thin almost model like. Her heroine has curves and some meat contrary to many books I have read. I didn’t like the F-bombs all through the book, but hey, that's perhaps goes with their mostly legal business. We also get introduced to a stream of Ferraro Family and their extended cousins in the book, which definitely means there will be quite a few books that would spring from this first one. Key characters we meet (other than Stefano and Francesca) along the read - Stefano's brothers (Giovanni Ferraro, Ricco Ferraro, Vittorio Ferraro, Taviao Ferraro), his sister Emmanuelle Ferraro, Emilio Gallo and Enzo Gallo (First Cousins to the Ferraro family), their mother Eloisa and father Phillip, The Greco family (Extended cousins forming the Investigators of the family and includes Zia Rachelle, Zio Alefo, Romano, Renato, Rosina and Rigina), Lanz and Deangelo Rossi (his New York cousins), Salvatore, Geno and Lucca Ferraro (Cousins to Stefano Ferraro's family who also live in New York) and finally Tomas and Cosimo Abatangelo (cousins who play the role of Emmanuelle's bodyguards). The plot is powerful with equally strong male and female characters. Although the male characters are very over protective and dominant bordering on scary. An understanding woman with very strong will and acceptance to everything what the Ferraros as can only survive with them. The sexual scenes are very intense and a bit rougher than I would like but still were enjoyable to read. However, there are still passages repeated again and again, although much lesser than the previous books. At least this time around they are more connecting than before. Certainly a good book to open the series with leaving enough hints of quite a few follow-up books. The book left me craving to pick the next one immediately, but alas it is not for another year. Pick it up if you get a chance and I know you will enjoy it. 1) The Ferraros - male and female - wear pin-stripe suits when in public or in mission. The stripes let them to play with light and shadow well, so they disappear without raising a suspicion. Genius idea. 2) Few scenes are shown between Emmanuelle Ferraro and Valentine Saldi (of the notorious mob family, the Saldis) that give us a reflection into a future book perhaps involving both these characters. It would be interesting to see how these two might or might not combine the two families that have been at war since a century. 3) Nicoletta Gomez a 17-year old abused teenager that Stefano rescues also shows abilities of a shadow rider although she doesn’t know yet. I am guessing she will be a mate for one of the brothers. I wonder who that would be, although my gut says it would be Taviano. 4) Grammatical errors in the book that I found in the uncorrected proof. I am hoping these are rectified in the released versions post June. a. On pg. 195, para 4, the author writes about Francesca explaining her past with her sister. One line looks as if Francesca was sleeping with the guy but infact it was her sister. A mistake perhaps in phrasing of the words? b. On Pg. 210, para 5, there is an extra "a" in the line "They wore their wealth….". c. On Pg 223, para 4, there is a "you" missing in the last line. d. On Pg. 315, para 8, in the first line, it should be "thought" instead of "though". e. On Pg. 350, after para 3, "you" is missing in the line. f. On Pg. 384, para 3, the first line has an extra "one" before the word "from one portal to…". It is not required. g. On Pg. 418, parah 4, in the third line instead of "So much" it is written as "Some much..". h. On Pg. 434, para 2, line 5 has an extra "the" in front of "all the money…."